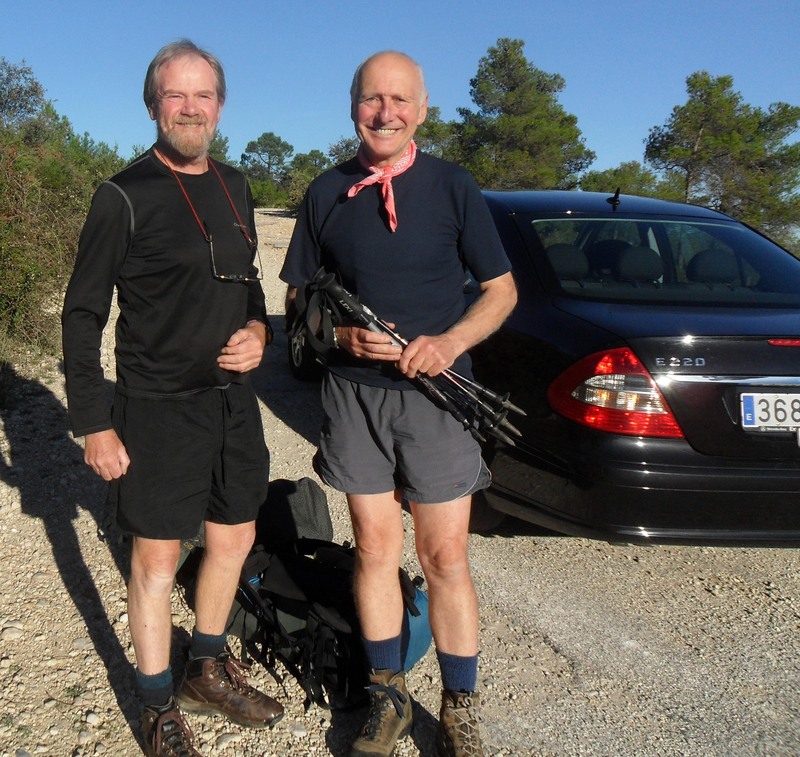 Having been at Enguera a few weeks ago walking south on the GR7 [see Gr7 Trip Prelude. 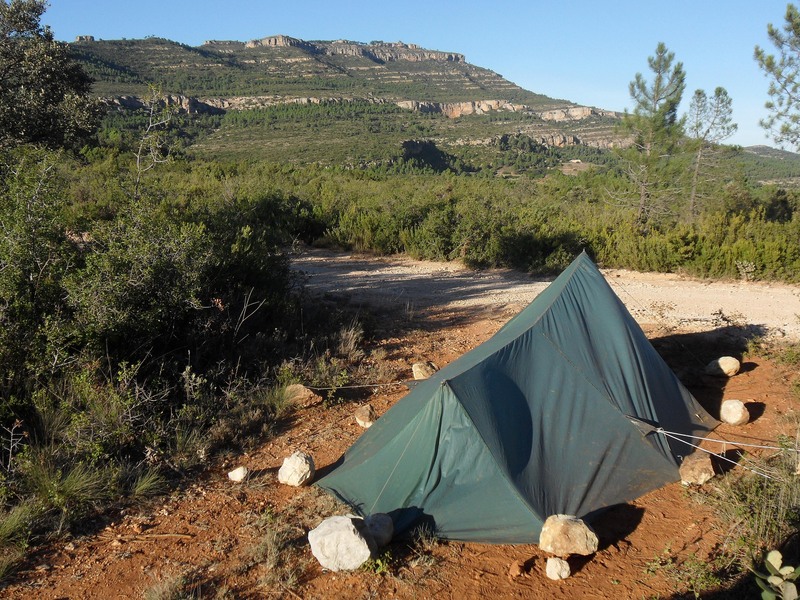 Its a gas Oct2nd] I was back again with H and both fully laden with backpacking gear. 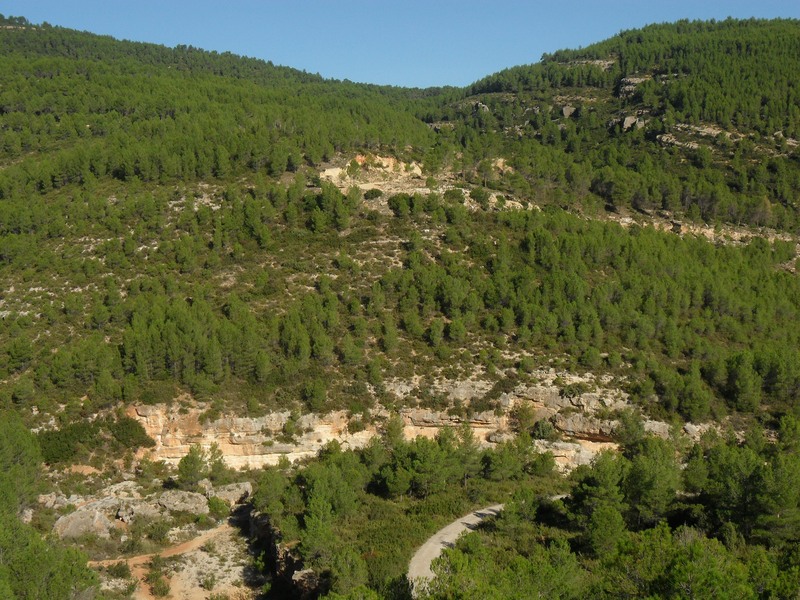 Repeating the journey Liverpool to Alicante by plane, train to Xativa and a quick taxi to Enguera. We were soon swimming in the hotel pool to freshen up from the travel. The notorious butane gas cylinder was recovered with relief from reception. Samuel the taxi man came to collect us in the morning for the 18k trip up to Benali. He was in his smart Merc so my plan of a few extra kilometers on the dirt track to the Rio Grande evaporated. We trudged down the well surfaced track under our heavy loads cursing Sam’s protective nature towards his car. I’ve driven down far worse tracks whilst out climbing in Spain. We were carrying 3litres of water as the first fuente was over 27k away and on the first day we did not want to overdo things. 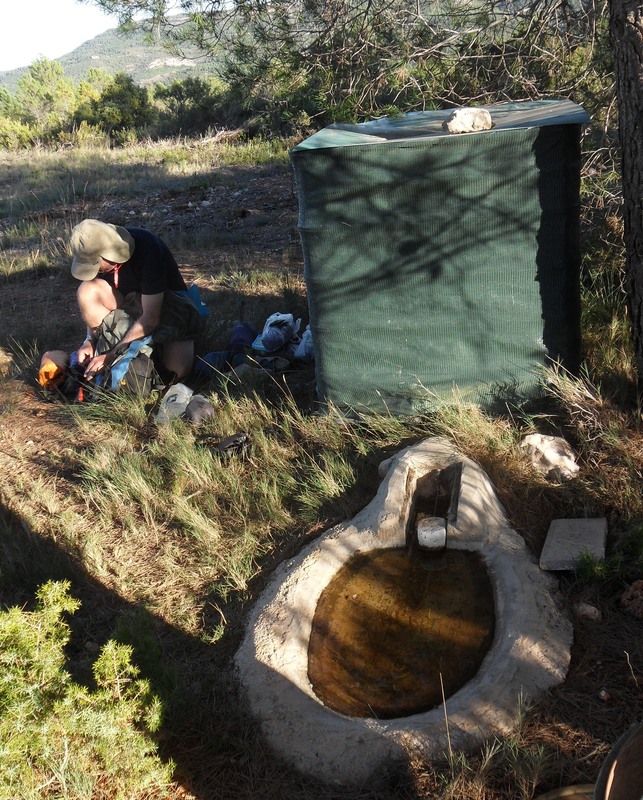 Water for camping is always a problem in Spanish mountains. Several forestry jeeps passed us, they stopped for a chat but any information gained from them seemed conflicting. Of course the Rio Grande was dry. Dropping down to the Rio Grande. The rocky escarpment of Caroche [1126m] was always visible and didn’t seem distant but the tracks in this wilderness are very tortuous avoiding the ravines. 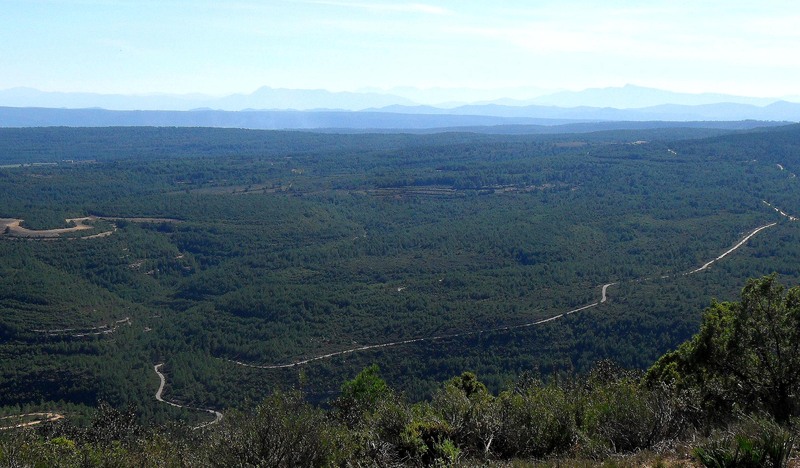 Looking south over the forests. The day became hotter and hotter as we climbed and descended into another ravine and some food in the shade. We realised the hours were passing and we wouldn’t make the fuente at Collardo del Caroche so we started looking for possible camp sites at 5pm – not easy in this rocky territory. A side track looked promising with some flat ground. Whilst we were investigating it we noticed a partridge feeding set up, seeds and water. Our own 20 gallon container of water!! How lucky is that? Get the brew on. The tent pegs wouldn’t go into the stony ground but there were plenty of rocks around. Under the slopes of Caroche a full moon and clear skies gave us lots of light and stars, and a cold night!